Imagine having an attractive wooden kitchen cart, breakfast bar, storage cabinet, and a butcher block food preparation surface, all in one. Well you can, with this wooden kitchen cart and breakfast bar made from strong sustainable hardwood. It looks great, is highly functional in multiple ways, and will fit in well with a wide range of existing kitchen décor schemes already in place. The piece is ideal for a kitchen where frequent cooking and food enjoyment is a priority. The wooden kitchen cart sits on wheels which enables it to be manoeuvred easily from one part of an interior space to another. Built into the cart are a series of cabinets for the placement of kitchen items such as pots, pans, and baking equipment. Two drawers provide room for cutlery, cooking utensils, and similar accessories, whilst a knife block offers secure storage for your favourite kitchen knives. There’s also a rack for tea towels. One of the best additions to this kitchen cart is the breakfast bar surface area which allows you to also transform the cart into a dining surface for breakfast, lunch, snacks, and coffee time with friends/neighbors. 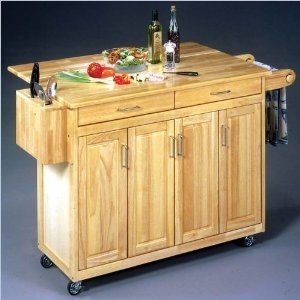 You can buy it from here: Wood Top Kitchen Cart with Breakfast Bar . Read the product page for more information and great reviews. 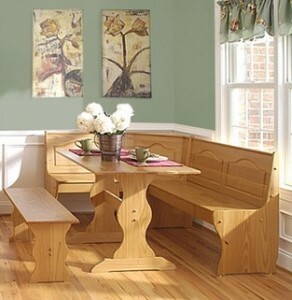 The Linon Caitlin 3 piece breakfast nook set is made from pine wood and is not only attractive on the eye but fully functional as a dining space for all the family. It can be placed in the corner of a home kitchen and can complement an existing dining table arrangement in a nearby dining room space. As their name suggests, breakfast nook sets can be utilized as a morning eating place as well as being a location for more intimate social coffee and cake get-togethers with visiting friends and family. In the basic terms, a breakfast nook is a smallish space frequently enclosed on three sides and situated in or off the kitchen interior. Casual dining is the key word when it comes to this type of furniture arrangement and the Linon Caitlin set can seat between 4 and 6 people depending on the main usage of the table. As I have personally found, breakfast nook tables are excellent for board-games with children and light reading when natural daylight streams through nearby windows, as seen in the image above. Breakfast nooks are perfectly little arrangements for families with young children. The kids can be served their food from a nearby food preparation area whilst all the time the parent can keep an eye on what they are doing. This applies in some ways to when friends visit too and conversations and laughter can continue without having to leave the room to get drinks and food. Placement next to windows can provided the seated people with lovely views of a flower filled garden or scenic street. The 3-piece breakfast nook I found here is made from good quality Brazilian pine wood that has been given a lovely light honey finish. The attractiveness of the wood makes it a great decorative addition to a wide variety of existing kitchen interior décor schemes. The light tonal nature of the set will lift up a kitchen’s ambiance even during the winter months. Included in the set is a bench, table and corner nook seating piece with secure back rests. As you’ll see from the reviews, this table nook set has received some great feedback from previous buyers. You can buy it from here: Pine Wood 3 Piece Breakfast Nook Set. By the way, the Nook bench can be interchanged to fit in a right or left-facing corner depending on your kitchen’s design.